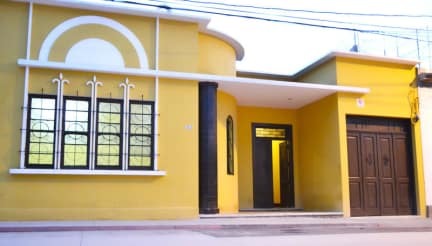 Hostal Rocio bnb is a new site for lodging in Guatemala. In the sixth walk are all the bars, nightclubs and restaurants in the area, as well as shops, supermarkets, where you can buy souvenirs, clothes, shoes and more. We have optional service of delicious breakfast, pancakes, coffee, fruit, tea, bread, juice, etc. We have patio and external dining room, television in the living room with furniture for rest and an equipped kitchen where you can use it. We have 5 rooms, including two patios and even smoking area. We have security and reception service 24 hours a day. In addition to laundry and drying machine for a minimum price. Computer. Circuit security beds, city maps, refrigerator, drinks and more. Our location is perfect. Within walking distance of all the bus terminals that go to the main destinations of Guatemala. If you take a taxi from the airport you only give us our address, you should not charge more than US $ 13.00. We also have pick up at the airport for the same amount. It is very easy to locate, the color is yellow mustard with white identified with the number 5-19. Located in the best point of the city, one (1) block from the sixth avenue walkway and the San Sebastián transmetro station, 3 blocks from the central market, the cathedral, the national palace, the Constitution Square and museums of history of the capital. 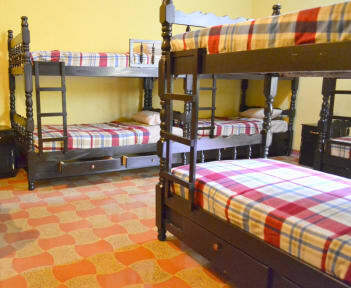 We offer private and shared rooms. Our rooms are spacious and new, each with ventilation, windows, bedside tables and lamps. In addition, lockers for added security. Each one with a mirror. Everything completely comfortable for our guests.